Before moving we would travel from Herefordshire to Scotland for a Winter break in March. Because we now live in Scotland we decided to look for somewhere to visit in January too, instead of the city breaks we have previously done. An easy decision to make for us as we had stayed at Poppies Cottage, Isle of Mull the two previous years. So what is bringing us back to the same place? The entry door takes you straight into a utility room which has a tiled floor so you don’t have to be too precious about coming back from the great outdoors in your mucky boots and wet jackets. Washing machine, tumble drier and a cupboard with vacuum and broom are all neatly managed in here along with a sink. From here we make our way into the kitchen. 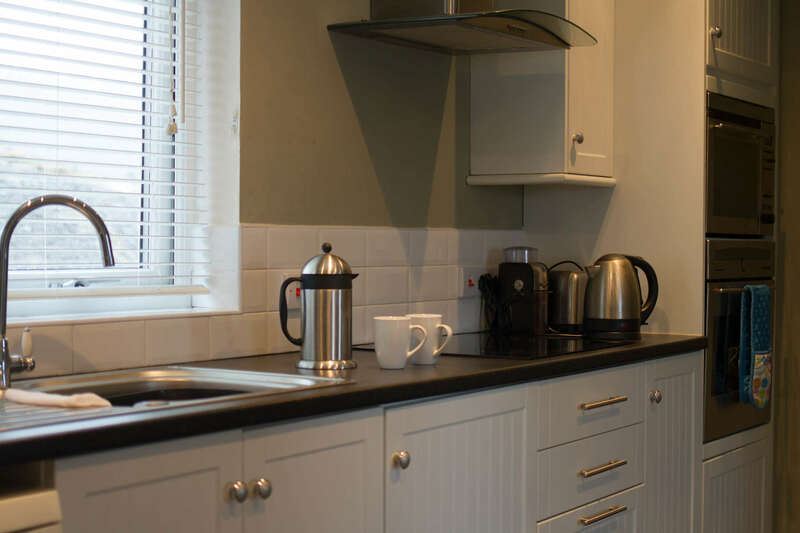 You will find everything you need in here for your self catering holiday – cups, plates, cutlery, pots and pans even a bottle opener so don’t panic if you forget yours! We ate in every night and making things like chilli con carne and curry with no problems. I’m not used to having a dishwasher at home so just do the washing up but there is one in this kitchen if you so wish to use it. Large fridge freezer, plenty big enough for a weeks worth of food and drink! There is a rather nice oven (with a separate grill) and the electric induction hob is really responsive too. The large window looks out on to woodland and hillside – great view when washing up! The large arch from the kitchen leads us to the living/dining area. I remember the first time I walked into here and you are immediately drawn to the large picture window. Not only does this allow great light into the room but it’s nice to stand and admire the view in all weather whilst drinking your cuppa. I will get back to the view shortly. One of my other half’s requirements whenever we look for self catering property “has it got a wood burner?” What is it with boys and fire? Anyway, there is a large woodburner and this creates enough heat to warm the whole cottage. For me, even in January when the wind is blowing outside I still have to stand by the back door for a minute too cool down, it does get rather toastie. Comfortable living area – two large leather sofa’s, freeview tv, DVD player and stereo (you can also get radio stations on the freeview). There are also some board games, books and magazines should you wish to spend your evenings not staring at the telly. The dining area has a decent size table with four chairs, plenty of room for breakfast and evening meals. Here there is also a door which leads out on to the small secure garden and picnic bench. Into the bedroom and there is a four poster double bed, a dressing table, a wardrobe, a rocking chair and also has two large windows over looking the Sound. You don’t even have to get out of bed to admire the view. The bed is nice and comfy, warm too. All bed linen and the towels are supplied so that is something else you don’t need to bring with you. Believe it or not I have seen some places advertise that linen and towels are NOT included. Here at Poppies they also supply each property with a hairdryer. The bathroom has two doors, one leading straight from the bedroom and the other in to the hallway. If I take you in via the bedroom door there is a double jacuzzi bath which works wonders after a long day walking. There is also a rather nice shower with lots of extra jet sprays and settings but I have to admit I haven’t tried them, it all looks a bit complicated to me! Our most favourite part of the bathroom is the infrared sauna. We used it every day to help relax and thaw out after a day walking or watching wildlife. As promised I go back to the view: and as returning visitors we have seen sunshine, rain, cloud, the cloudy solar eclipse in 2015 and snow. All making the exact same landscape look completely different. We have seen white tailed sea eagles, red deer, buzzards, herons, divers and rabbits all before breakfast! Even at night it can put on a display, in 2015 we saw the Aurora Borealis in all it’s splendour. On a clear night you can see more stars than you have ever seen before and no light pollution. We have also heard owl’s whilst standing outside in the cold under a full moon, really quite magical. Each one of the four properties allows “two well behaved dogs.” I have to say as a non-pet owner whenever we have visited we have not seen any signs that dogs have even been in the property, no stray dog hairs so don’t be put off by seeing they allow pets. There are some great walks straight from Poppies Cottage for walking the dogs or just down the road to the beaches too. I love the fact that the cottages have ground source heating throughout too and can be controlled. I always have to turn the bedroom one off because otherwise it gets too warm, even in Winter. 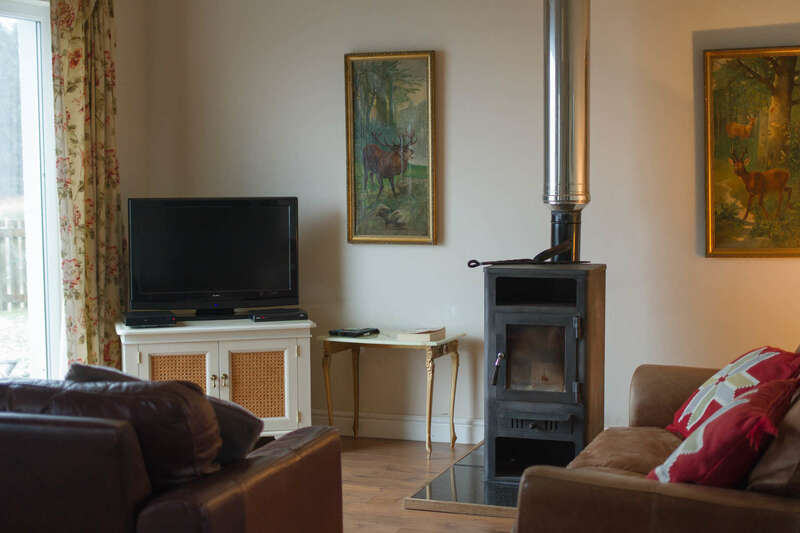 We have previously stayed in one of the other cottages and know that it was also decorated and kept in good condition. The wood burner is also made up for your arrival so all you have to do is light it. It’s little thing like this that make us return. There is a folder of “How to,” instructions for managing the heating, shower and oven. Listings of recommended places to visit, boat trips and local pubs and wildlife tour guides; and a VisitScotland iCentre just by the ferry terminal so this could be worth popping into. 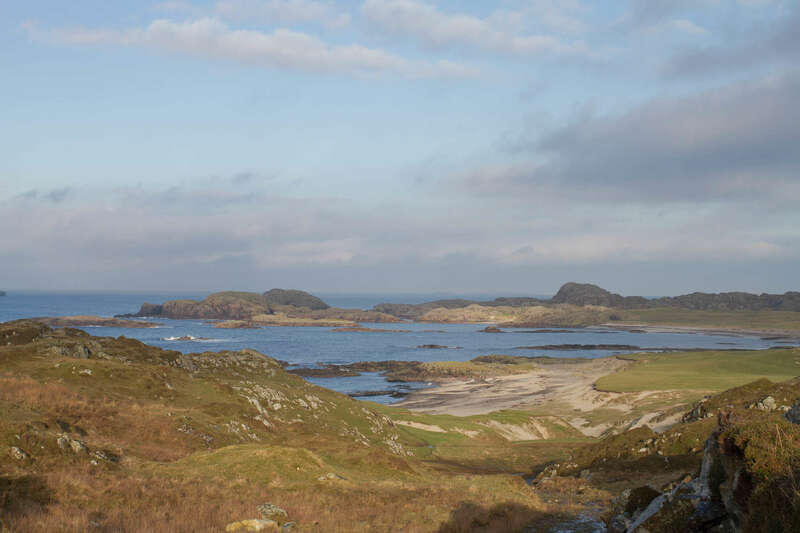 All in all we really enjoy our stay at Poppies Cottage, Isle of Mull and winter is just perfect for watching wildlife, visiting small villages, popping over to Iona, walking and coming back to a roaring fire and sauna! 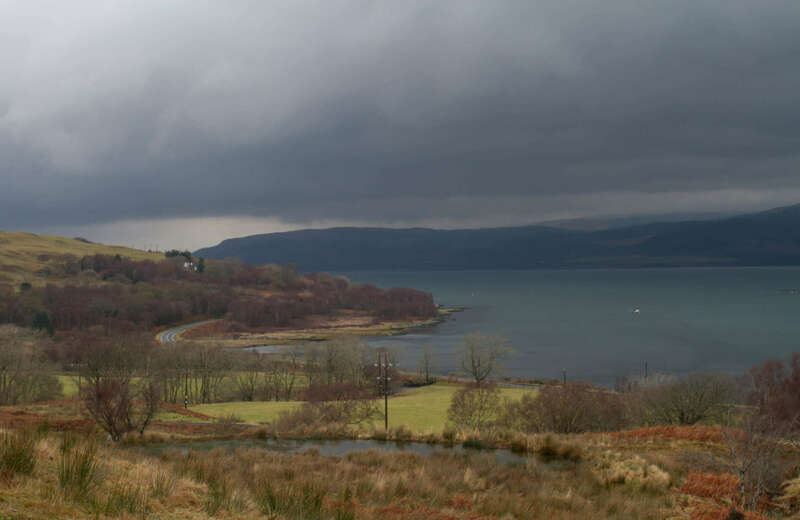 Situated well between Craignure, Salen and Tobermory you get the feeling of isolated wilderness, with creature comforts and local shops. With the added bonus of CalMac Ferries fare reduction under the new RET (Road Equivalent Tariff) system there really is no excuse not to get yourself over to the islands. If you want to know more about our Winter break on the island I plan to blog about our days out, the wildlife was saw and the walks we had, so keep your eyes peeled for those right here or over on my Facebook page. It is a really lovely place to stay. The view is constantly changing and I agree it is something which you would never tire of. It really is stunning Victoria. Thank you, I’m glad you like my work – thanks for the follow over on Twitter too.